This section describes what you need to know about ordering individual pager system parts to replace missing parts, expand your current system or increase its range. 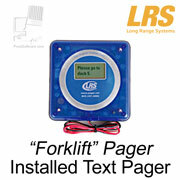 Most LRS pager system parts are described in the FoodSoftware.com catalog and may be ordered individually using the FoodSoftware.com shopping cart. Links to all pager system parts are listed at the end of this product guide. Pager System Major Parts: Most pager systems have three main parts- transmitter (with control panel), pagers and pager charger. When you use pager equipment, it's perfectly normal to replace, increase, upgrade or enhance these parts as you go along. Pager Replacement: There are usually many pagers (five to fifty or more) in a system. They are used by customers or staff all the time so they are subject to heavy use and wear and occasional loss. LRS equipment is professional restaurant equipment built to withstand the abuse that is typical in this application and LRS pagers rarely break down in their normal warranty period of two years. Pagers are more likely to go missing, but at a surprisingly low rate considering how often they are handed out- one pager lost every sixty days is typical for a very busy restaurant. (Consider loss to be a sign of your success!) Pager batteries typically last from two to five years and are under warranty for one year. After two years, pagers may be replaced (immediate) or refurbished (takes longer). Any number of individual pagers may be ordered as needed to replace missing or failed pagers or expand the total number of pagers. Pager Expansion: Pager systems are often first tried in smaller sizes (twenty guest pagers or five server pagers) and expanded later as needed. Expansion pagers can be ordered in any quantity at any time (but the best values are when purchased as part of a system or in larger quantities). Pager Numbers: When ordering pager replacements or expansions, please provide pager numbers. For example, if you are missing pagers 3, 6 and 8, just request these numbers and we will provide replacements already marked and programmed. When expanding, sometimes it's convenient to request new ranges or even new colors. Let's say your orginal set of pagers are 1-30, but you want to set off a next new series of thirty pagers (because they are new or maybe for a different purpose) and so you have them numbered as 101-130. Transmitter Replacement: Transmitters are radio devices with control panels or push buttons that signal the pagers. 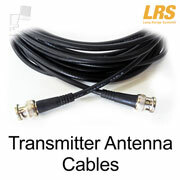 Transmitters are highly reliable and normally last for years without problems. Most transmitter issues are actually small-parts problems such as blown power supplies or disconnected or missing antennas (both easy and inexpensive to fix). The other usual issue is placement near too much metal- this is true for any radio device- so keep transmitters away from metal furniture, equipment and walls. Transmitter Expansion: Most systems need only one transmitter but you can have more if you want to signal from more than one location. Kitchen and host transmitters can have up to three distinct alert patterns (one vibration means "kitchen", two vibrations means "bar", etc.). Push-for-service transmitters are different in that you may have many transmitters (one per table, door, room, etc.) and few pagers (i.e., thirty table transmitters signalling five server pagers). Like pagers, transmitters can be replaced or expanded in any quantity at any time. Repeater Transmitters: Repeaters are devices that listen for weak or distant signals and repeat them anew at full power. LRS repeaters are inexpensive, plug-and-play devices that you can pepper around your large or difficult facility to ensure coverage where needed. Transmitter Upgrades: More broadcast power increases range. 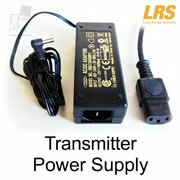 Some LRS transmitters can be replaced with higher-power upgrades. Antenna Placement and Size: Antennas work best when placed as high and away from structures as possible. 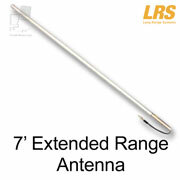 LRS transmitter antennas are normally right on the transmitters but they can be detached and moved to better locations (i.e. outside wall or roof) using antenna cables. Larger antennas also help. We have cables (3' to 50') and 7' extended range antennas. Pager Charger Replacement: Pager chargers are relatively simple and do not get much wear, so they are very reliable and rarely need service. However, their power supplies (that plug into the wall sockets) may be blown out by power surges (this is by design to protect the other parts). Also, they can �fade� after two or three years and may not be able to charge a full group of pagers as they did when new. If your power supplies fail then your entire system goes down too, so it is important to keep spare power supplies handy. Pager Charger Expansion: Guest pager charger bases handle up to fifteen pagers and are expanded by adding more bases. Server pager charger racks handle five pagers are are expanded by adding more racks. Click on the links or graphics below for more details or to place orders. Guest Pagers (CS7-Red Lights): "Guest" or "coaster-style" pagers are the most common style of restaurant guest or hospital patient pager.Please be sure to specify the pager numbers needed when ordering replacements or expansions. Guest Pagers (CS7-Blue Lights): "Guest" or "coaster-style" pagers are the most common style of restaurant guest or hospital patient pager. Please be sure to specify the pager numbers needed when ordering replacements or expansions. Guest Pagers (CS7-Green Lights): "Guest" or "coaster-style" pagers are the most common style of restaurant guest or hospital patient pager. Please be sure to specify the pager numbers needed when ordering replacements or expansions. AdverTeaser Pagers: AdverTeasers are "paddle" style pagers such that you can install two-sided business card inserts into the handle for advertising or instructions. These are typically used as guest or patient pagers rather than for staff. Please be sure to specify the pager numbers needed when ordering replacements or expansions. Server Pagers: These "server" or "staff" pagers are the most typical type used by restaurant servers or office staff who need only a silent page with no text message. These are small, vibrating pagers (usually silent but can beep), typically worn on belts or carried in pockets. Server pagers are used so much by so many people that at some point they are bound to be misplaced, which is a reflection of how much restaurants depend on them since they improve service so greatly. Manager Pagers: "Manager" or "Alpha" pagers are also small, belt-worn pagers that display text messages such as which location called for service when there are many transmitters. They are less likely to be lost or damaged because they handled more carefully by fewer people. "Freedom" (T7470) Transmitter: This model is usually included with our larger guest paging systems (twenty or more pagers). It features the greatest range available in our line and is able to contact guests, patients or staff using a comprehensive variety of paging modes- signal or text to LRS pagers via radio and recorded voice message or texting to cell phones via internet. The T7460 replaces previous models T7400 and T7450 (which are no longer available). "MT" (T9560MT) Transmitter: The MT is the standard transmitter for our smaller guest pager systems (twenty pagers or less). This new model is portable, simple, compact, rechargeable and easy to use. Though normally used at hosts' stands and similar stationary locations, it is small and light enough to be hand-held so you can use it virtually anywhere. "EZ" (T9560EZ) Server Transmitter: With twenty one-touch buttons, the EZ is the standard transmitter for our smaller server pager systems (under twenty Star or server pagers). It is simple, compact, easy to use and runs on either AC or batteries. It includes a whiteboard for writing servers' names for the pushbuttons. 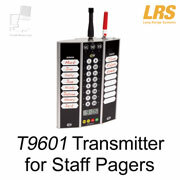 T9601 Server Transmitter: The T9601 is the standard transmitter for our medium server pager systems (fifteen Star or server pagers). It is has more robust power, features and construction than the MT. It includes magnetic strips for writing servers' names for the pushbuttons. Butler XP Transmitter: This is our main push-for-service one-button transmitter and is for both indoor and outdoor use at service counters, cabana, poolside, beach service, healthcare residences, executive dining rooms and door access. The Butler XP is inexpensive, small, battery-powered, weather- and water-proof and has a variety of colors and mounting options. Butler II 5-Button Transmitter: This model features five programmable buttons and can have five combinations of messages and recipients. It is often used for small restaurant server pager systems or clinic exam room staff paging. It is the only push-for-service transmitter that can signal all LRS pager types. 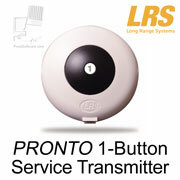 PRONTO 1-Button Transmitter: Features one large button which can be programmed with a message and single or multiple recipients. It is often used for clinic exam room staff paging or restaurant tables to call servers. Can be wall- or flat-surface mounted. Optional wall power. 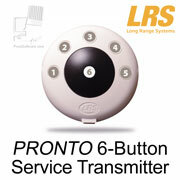 PRONTO 6-Button Transmitter: Features one large button and five small buttons which can be programmed with different text messages and recipients. It is often used for small clinics to page staff or restaurant tables to call servers. Can be wall- or flat-surface mounted. Optional wall power. 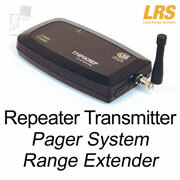 Repeater Transmitter: Transmitter repeaters can be added to LRS pager systems to increase their range. Multiple repeaters can be combined to form networks that expand coverage across very large campuses or penetrate throughout very large buildings. Also useful to make wireless connections to rooftop antennas or to greatly amplify signals from one or more push-for-service type transmitters. Server Pager Cradles (aka �belt clips� or �holsters�): Waitstaff pagers are usually worn for entire workshifts clipped to belts or pockets. Belt clips are part of the pager cradle and not the pager itself, so if clips are broken, only cradles are broken and not the pagers. Belt clips break regularly when people brush by things and get caught. For this reason, replacement cradles are inexpensive and sold by the dozen. Power Supplies: Small power supplies (1.5A) are used by transmitters and larger ones (4A) by pager chargers (both guest and server). They are reliable but they blow out if there is power trouble and then your transmitter or charger stops working until the power supply is replaced. It�s important to keep spare power supplies on hand because in emergencies, air shipping of power supplies is more expensive than the power supplies themselves. Guest Pager Charger Base: There is normally one charger base per fifteen guest pagers. When expanding your pager system, make sure you have a total of two bases for 16-30 pagers, three bases for 31-45 pagers and so on, up to four bases total. When ordering charger bases to expand your system, be sure to use the shopping cart option that includes the jumper cable too. 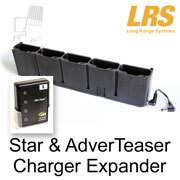 Star and AdverTeaser Pager Charger Rack: Each charger rack can hold up to five pagers. Up to five racks can be connected to one power supply. When ordering charger bases to expand your system, be sure to use the shopping cart option that includes the jumper cable too. 41 items found searching fields. 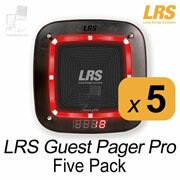 Order this set of five Guest Pager Pro "coaster-style" pagers (model CS7) by LRS for LRS Guest Pager System Kits to replace missing guest pagers or increase the total number to any quantity desired. The pager numbers are programmable and are shown in the pager's LED display. Color options are red, blue and green. S... more. 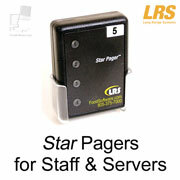 LRS "Star" pagers are the standard small black pagers used by staff or servers that are usually clipped to a belt. Order this Six Pack to replace pagers or add more to your existing system. See the LRS LRS Restaurant Server Pager Starter Kit (5 Pager) listing for details about server paging systems. ... more. 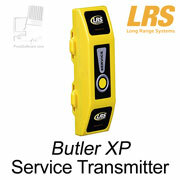 The LRS Butler II five-button pager transmitter has features which makes it especially suitable for situations such as small restaurant server paging or doctor's interoffice paging. Inexpensive, small and battery-powered, the Butler II has five PC-programmable buttons and an input port for activation by doorbells or door sensors. ... more. Place PRONTO push-for-service pager transmitters everywhere you wish so anyone may contact your staff with a choice of one or six buttons for different messages for each button. In restaurants, put PRONTOs everywhere needed. Program the buttons to send any text message to any pager. Best of all, PRONTOs are inexpensive enough so... more. 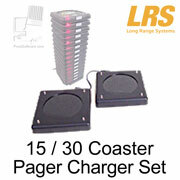 These LRS pager system components are both the charger and storage system for up to 15 or 30 coaster-style pagers (Models CS4 to CS7). Order this item as part of a custom system, to expand your current system or replace your current charger.... more. 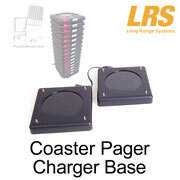 This LRS pager system component is part of the charger and storage system for coaster style pagers (models CS4 to CS7). Order this coaster-style pager charger base and jumper wire as part of a custom system, to expand your current system or replace your current charger bases.... more. Customize your pagers with labels for the Coaster Call and custom inserts for the AdverTeaser paddle. Promote your business, advertise specials and new products or simply customize the pagers with your company logo.... more. 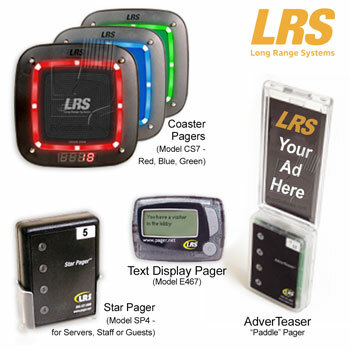 These LRS pager system components are both the charger and storage system for up to 5, 15 or 25 Star- and AdverTeaser-style pagers. Order this item as part of a custom system, to expand your current system or replace your current charger.... more. 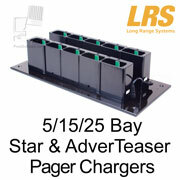 This LRS pager system component is part of the charger and storage system for Star (SP4) and AdverTeaser (AT4) pagers. Order this pager charger expansion rack and jumper wire as part of a custom system, to expand your current system or replace your current charger bases.... more. These are transmitter repeaters that can be added to LRS pager systems to increase their range. Order this as part of a custom system or to expand your existing system. 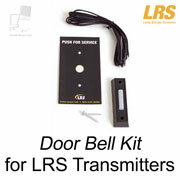 LRS repeaters can repeat signals indefinitely, giving LRS the best range in the industry.... more. 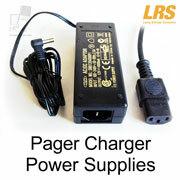 This LRS pager system expansion kit adds pagers and charger capacity to your existing LRS staff or server pager system. It includes five Star (Staff/Server) Pagers and a five-bay charger expansion rack and options to number the pagers as 6-10, 11-15, or 16-20. Installation is plug-and-play simple.... more. 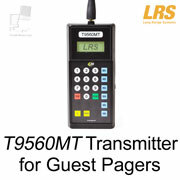 Replace missing LRS guest pagers the easy way with this pager replacement subscription. Receive two new pagers every one, two or three months automatically, at discount prices too! Order with this listing to subscribe to replacement smoke gray guest Coaster Call pagers delivered every one, two or three months (your choice).... more. AdverTeasers are "paddle" style pagers such that you can install business card inserts into the handle. Order this item as part of a custom pager system, to expand your current system or replace your current pager. 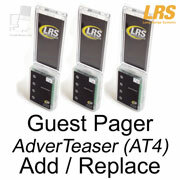 See the LRS Restaurant Guest Pager Starter Kit (15 Pager) listing for details about the gues... more. 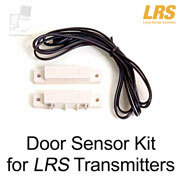 This individual LRS component is the "doorbell kit" for Butler pager systems. Order this item as part of a custom system. This device allows Butler I and Butler II pager systems to act as a remote doorbell. When the button is pressed it signals a standard pager or sends a text message to an alphanumeric pager. ... more. These are individual transmitters that can be added to the LRS Restaurant Pager System Kits either to expand your guest paging system or replace a current transmitter. This "MT" (TX9560MT) model features simplified operation, battery or wall power, and can signal all LRS pager types for guest, server or staff paging.... more. These LRS pager system components are part of the pager charger systems. Order these as part of a custom system, to expand your current system or replace your current power supply. Model L1-0020 is for stack chargers and L1-0034 is for rack chargers.... more. 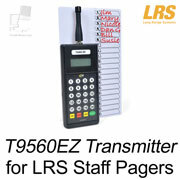 These are individual LRS T7560EZ restaurant pager transmitters that can be added to LRS Restaurant Server or Guest Pager System Kits to either expand, replace or upgrade your current server pager transmitter. This "EZ" model transmitter is ideal for kitchens, bars and other food prep areas. With its internal rechargeable batterie... more. These are individual transmitters that can be added to LRS Restaurant Pager System Kits either to expand your guest paging system or replace or upgrade a current transmitter. 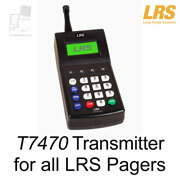 The T7470 Freedom model features abilities to contact guests or staff using a comprehensive variety of paging modes- signal or text to LRS pagers via ... more. 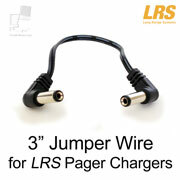 This is the 5" jumper wire for LRS pager chargers. Order this item as part of a custom system or to replace worn or dirty jumpers. Use these to connect pager charger bases, racks or slots so they can share a power supply.... more. 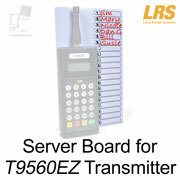 This is the replacement Server Board (name board) for LRS T9560EZ Server Pager Transmitters. (The Server Board is the white plastic dry-erase board that is attached to the back of the T9560EZ transmitter with user-serviceable screws. The board is printed with numbered lines 1-20 for writing staff names by the corresponding... more. These individual LRS components are part of a range-increasing and interference-prevention system for most LRS pager transmitters. Order this item as part of a custom system. This listing is for ten-foot cable antenna extensions with shopping cart options for twenty-five- and fifty-foot cables. ... more. This individual LRS component is part of a range increasing and interference prevention system for LRS pager transmitters. Order this item as part of a custom system. This is the seven foot extended range antenna which can provide twice the range the pager transmitters normally provide. Mounted indoors or out, its slim design allows un... more. The door sensor kit allows the Butler System to monitor any entrance, exit, door, window or any opening. 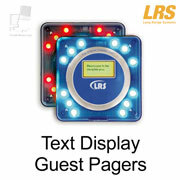 These are individual Coaster Call Guest Pagers (model CS7-Blue) by LRS for LRS Guest Pager System Kits that replace missing guest pagers or increase the total number to any quantity desired. New for 2015, this model CS7 guest pager has new features and greater durability while still compatible and mixable with legacy coaster... more. 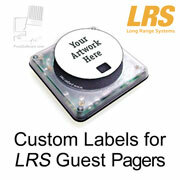 These are individual Coaster Call Guest Pagers (model CS7-Green) by LRS for LRS Guest Pager System Kits that replace missing guest pagers or increase the total number to any quantity desired. New for 2015, this model CS7 guest pager has new features and greater durability while still compatible and mixable with legacy coaste... more. 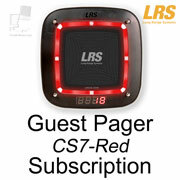 These are individual Coaster Call Guest Pagers (model CS7-Red) by LRS for LRS Guest Pager System Kits that replace missing guest pagers or increase the total number to any quantity desired. New for 2015, this model CS7 guest pager has new features and greater durability while still compatible and mixable with legacy coaster ... more. These Coaster Call Guest Pagers with Text Messaging are individual pagers that can be added to any LRS Restaurant Guest Pager system to increase the total number of guest pagers to any quantity desired. These pagers include a two-line text display that can show individual messages sent from the transmitter. Coaster Call Pagers with Text ... more. LRS "Star" pagers are the standard small black pagers used by staff or servers that are usually clipped to a belt. Order this item as part of a custom pager system, to expand your current system or replace your current pager. See the LRS LRS Restaurant Server Pager Starter Kit (5 Pager) listing for detail... more. 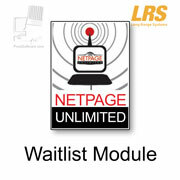 This item is a component of the LRS NetPage Unlimited IP/browser-based paging system. Order this item as part of a custom system. 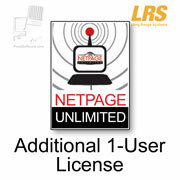 Add additional users to your existing NetPage Unlimited system with this one-user license. ... more. This item is a component of the LRS NetPage Unlimited IP/browser-based paging system. Order this item as part of a custom system. Add one or more guest/customer/patient/staff waitlists to your existing NetPage Unlimited system with this one-waitlist module. Note: This feature is sold on a per waitlist basis. ... more. 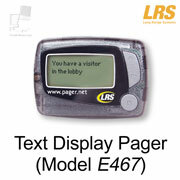 This LRS pager system component is part of LRS server pager systems. This is the belt clip ("cradle") for LRS Star (server) pagers. Order this package of one dozen to replace missing or broken pager cradles.... more. Order this item as part of a custom system, to expand your current system or replace your current power supply. This 12V DC 4A power supply is compatible with LRS Models T7400, T9000 and T9500 series transmitters and rack-style pager chargers for Star and AdverTeaser pagers. ... more. This is the software and USB cable set required to program LRS Butler XP and PRONTO pager transmitters.... more. 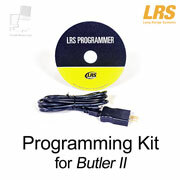 This is the software and RS-232 cable set required to program LRS Butler lI pager transmitters.... more. 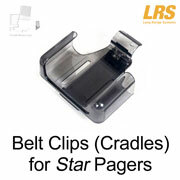 LRS "Star" pagers are the standard small black pagers used by staff or servers that are usually clipped to a belt. Order this Four Pack to replace pagers or add more to your existing system. 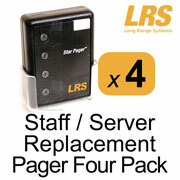 See the LRS LRS Restaurant Server Pager Starter Kit (5 Pager) listing for details about server paging systems. ... more. 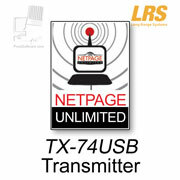 This item is a component for use with the LRS NetPage Unlimited IP/browser-based paging system and also the NETConnect Developer Software Package. The TX-74USB is a USB-connected, software-controlled transmitter that is able to signal or send text messages to all LRS pagers. Order this item to add Transmit Controllersmore. This catalog item is for purchasing service units for the LRS NetPage Unlimited IP/browser-based paging system. 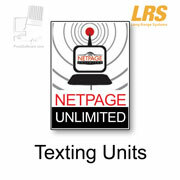 Order this item to provide blocks of texting units to enable wide-area texting to cell phones from the NetPage Unlimited communication system. Text message units may be purchased with this shopping cart in blocks... more.